Discover what awaits Season Pass owners in Ancient Greece. Assassin’s Creed Odyssey is a huge game, and after it arrives on PS4 on October 5, it’s going to keep growing. Post-launch content for Season Pass owners will include two major new story arcs told across multiple episodes, with each episode releasing approximately six weeks apart. 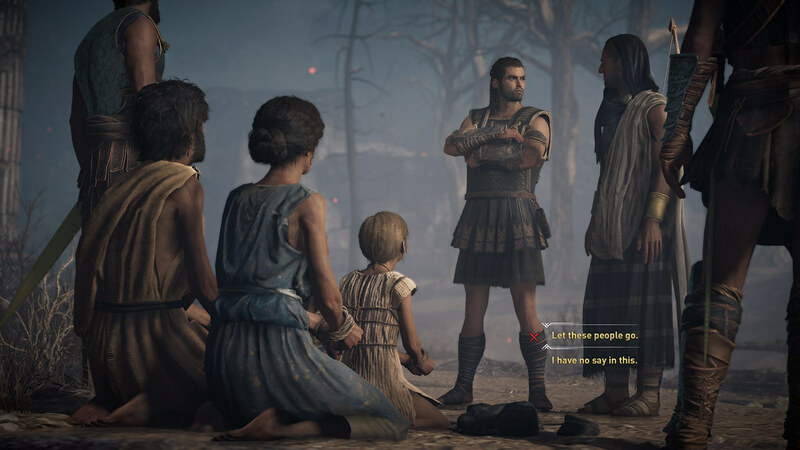 Between the releases of the larger episodes, The Lost Tales of Greece will bring a series of new story quests that will be free to all players, and they’ll be joined by free in-game events, including daily and weekly mercenary contracts. The first major arc, Legacy of the First Blade, launches in December, and introduces players to the early predecessors of the Assassins, including the first person to use a Hidden Blade. In Spring 2019, The Fate of Atlantis confronts players with creatures straight out of Greek myth and challenges them to discover the secrets of the sunken city. Additionally, Season Pass owners will get Assassin’s Creed III Remastered, which includes all of the original game’s content, plus Assassin’s Creed Liberation Remastered. Both games will support 4K and HDR on PS4 Pro, and sport higher-resolution textures, improved lighting, and other visual enhancements. Before the first post-launch content arrives, Assassin’s Creed Odyssey will deliver an epic adventure across Ancient Greece, in which you’ll match wits with historical figures and mythical monsters. 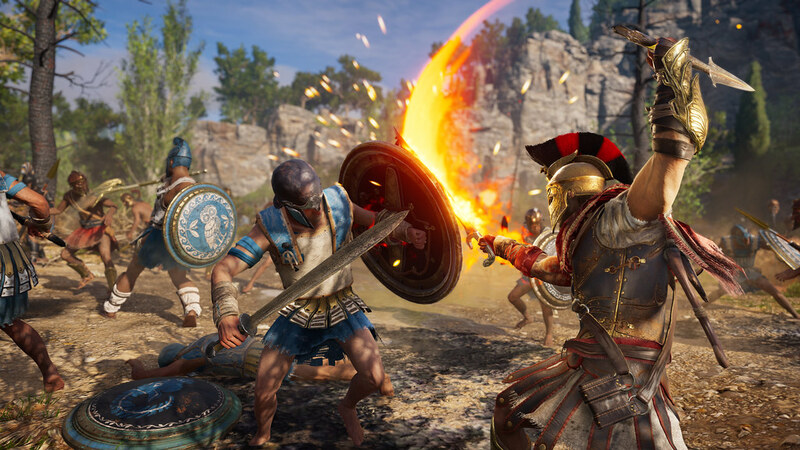 To find out more about what’s ahead when the game launches on October 5, we chatted with Jonathan Dumont, Creative Director for Assassin’s Creed Odyssey. How familiar were you with Ancient Greece when you started developing Assassin’s Creed Odyssey? Do you find you’ve learned a lot during development? Jonathan Dumont: We learned quite a bit (laughs). We’re not historians; we share a passion for history, but when we pick a setting, we do research up front, and we research a few settings. Then, when we lock in a good setting, we do quite a bit more research. The full team researches through books, literature, movies, anything we can find. In the case of our game, because Ancient Greece has something like 5,000 years of history, we brought in a specialist on our team, a historian. We always have a historian on our team, but now we brought in somebody that has a PhD in Ancient Greek history, so that we could know as much as we can. She’s able to read Ancient Greek, so she would go back into Herodotus’ texts and things like that, so we would get information directly from the primary source. The fun thing about Greece is, it’s a familiar setting for many people. So we know a lot of those legends and myths, we know a lot of history and historical characters, we know about Socrates – but we don’t know. We know about it, but we don’t know all the details, so we go through that same process where we start out knowing some of it, and we’re interested by it, and it’s a relatable world. Just as an example, you go around Attika, one of the regions in our world, and there’s an area called Marathon. That’s where the word comes from. And why is it called that? Because some dude ran 42 kilometers [or 26 miles, the length of a marathon] to warn Athens. So you start digging into terminology or concepts that you already know, that we’ve already been using for 2,000 years, and then you can label them; “oh, that’s why it’s called that,” or “oh, that’s why we do this now!” So it’s very interesting to see where we come from. We dive into it like students; there are experts on this somewhere else that know a lot more than we do, but we try to know as much as we can. You recently showed off the mythical side of Odyssey by revealing a high-level encounter with Medusa, which seems like the kind of thing that might ordinarily be kept under wraps until after launch. Why reveal her before launch? JD: I think it shows the things you’re going to be doing in the game; it’s not just Medusa that’s in the game. We have other mythical creatures that could be there, so we picked one that we said, “this should be a fun challenge.” We also wanted to show what the endgame content can look like as well, and what it feels like to have level-50 abilities, so people can say, “OK, that’s where it’s going to go.” I think it’s an interesting way to show progression. If you’ve played before, you might have played the E3 demo, which is maybe 20 levels in. So you get a little taste of progression there, but seeing a little bit of the final results – not final-final, but toward the end of the game – shows the promise that the game is different, the game is about the First Civilization as well. I think it’s cool to let people see things about a game, and not hide it until the end. There’s also quite a bit of stuff we’re not talking about yet, so we’re not burning everything. 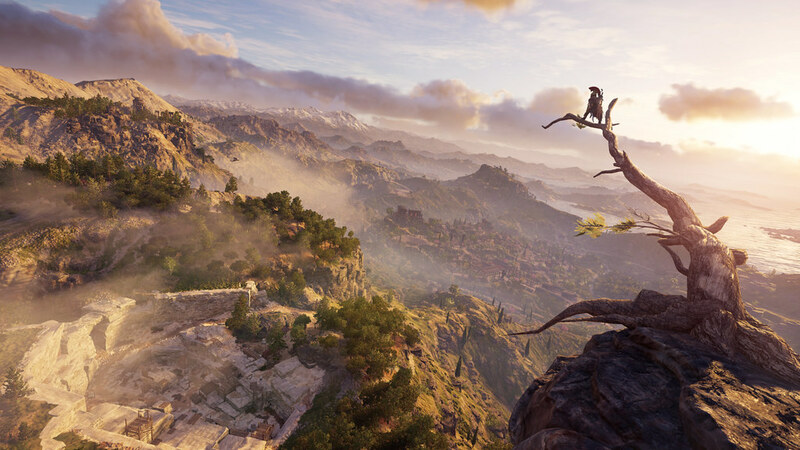 As we’ve seen in previous Assassin’s Creed games, technology left behind by the ancient First Civilization enables fantastical things to happen in a relatively realistic universe; is it creatively freeing to work with those elements? JD: Most of the game is pretty much historically accurate. We try to depict the Peloponnesian war, we go to Athens during the plague. We meet a ton of historical characters, and spend a lot of time getting to know them as well. What was important to us was to say, “all right, those are the facts that came out, how history was recorded” – but we also do something interesting in most of our games toward the end, where somebody picks up an artifact and burns people up or something. So what would happen if you had an artifact like that [from the start], and what would be the perceptions of the people living in that world about their gods and their mythology? Tapping into that, and trying to tie it to the First Civilization to make it credible in that universe, was interesting and very challenging, but opens it up to different things. It’s not like Medusa’s in the middle of Athens. These are found in secluded places in the world, so they’re mysteries. If you’re looking at the map of where you found Medusa, it is in one of the most remote places in the corner of the map, in this forest hidden behind the mountains. It’s not something that’s in your face; it’s some secret of that world that you will discover. I think [the First Civilization focus] gives us a little bit of flexibility; the theme that you have an artifact in your hands opens some doors for us to explore. After Assassin’s Creed Origins, which had the elephants and the Trials of the Gods, did you see more demand for big endgame challenges (like Medusa) for high-level players to pursue? JD: Well, while building an RPG, the challenge needs to go up; sometimes it’s hard to keep it on natural characters, like a humanoid character. In this case, I think it’s an interesting scale-up; if you were playing the game and you started with that, obviously it would be a little weird. For a game that you’re going to spend a lot of time in, having these challenges that are a little bigger than life are interesting. If you take a look at Origins, with the elephants for example, those elephants are pretty big. They feel like they’re elephants, but almost magical elephants. I think it goes with progression scaling, I think it helps actually measure yourself against the game and tap into that fantasy of exploring myths and legends. I don’t think that’s mandatory, that we were pushed into that, but it felt natural to do it with an RPG. What are you most excited for people to discover in Assassin’s Creed Odyssey? JD: I think it’s interesting to see some of the visual diversity we have. The Greek islands, more in the north, have more forest areas. There are always choices at the heart of the game, so there’s a lot of possibilities for you to exercise them not only in quests, but also in play style. What I’m excited about is that you can choose to play the game fully in stealth; you can go in forts and play it stealthy. Assassin’s Creed is over 10 years old, and through the years we’ve introduced different mechanics, so we all play a different way. I think our game caters to the way you want to play; if you say, “I just want to shoot people with a bow and arrow, because I’m a ranged guy,” you can actually do it, and if you want to stealth most of the game, you can do that. And if you just want to fight and kick people off ledges, you can do that as well. I’m actually pretty excited that the way people want to play Assassin’s Creed will be available to them, and a viable option. What, did you say AC 3 remastered and Liberation are coming to PS4? That deserves a headline of its own. Now maybe bring over the original AC as a classic. Love AC games, played them all. I’d make Assassin’s Creed Odyssey a day one buy if not for the Season Pass. People are sick of them. Also, remember that Assassin’s Creed Origin had discounts very shortly after launch. I bet Odyssey will be no different. Look at the success of God of War, Horizon Zero Dawn, and Spider-man. They all have some DLC, but it’s very different from the approach of Ubisoft and other publishers. Those titles were also PS4 exclusives. Odyssey is non-exclusive, so they have even a wider market yet they need to exploit gamers even more because of that! To me the best games are those without Season Passes. Not simply because they don’t have them but I think that they take greater pride in delivering a finished product. I am thinking of the above titles again plus Persona 5, for example. P5 even had a fair amount of DLC, but all cosmetic and nothing that impacted the base game or added to the story. Finally, to be fair, the one thing I do like about Odyssey’s Season Pass is that they include ACIII Remastered, and I guess, Liberation. With enough games unfinished as it as I’m happy to wait a few weeks for a discount during the holiday season. Completely and whole heartedly disagree with you in regards to season passes when it comes to single player games. Ubisoft is one of the few publishers that gets this right. I will be getting the Gold Steelbook edition for Odyssey just as I did Origins and enjoy the journey every step of the way. Having AC III and Liberation Remastered is an added bonus that I have been waiting for since they started remastering the past generation games. On the other hand I wish the co-op/competitve games did get rid of their season passes as all those do is separate and lower their player base with each release. Games like Call of Duty and Destiny, both Activision games, should either be $100 games that include base game plus all post launch content, or be $60 and use MTs for cosmetics to support their post launch plans. As for waiting for the game to lower in price, more power to you, but make sure to thank the early adopters for their purchase as they help bring those lower price deals to you that much faster. @Tatanka I agree with you, i havent bought a single Ubi game since AC III, I just borrow them from friends now. Unfortunately you and I are in the minority and so as long as the Ubisoft apologists keep theowing money at Ubisoft nothing will change to the positive. I look at Sony and what they are doing and just wish others would follow suit HZD and GOW are masterpieces. I sunk 200 hours into HZD and 40 hours into GOW and will pick it up again to try NG+. As for HZD and God of War, they are amazing games that support why you should own a PS. Horizon had no dlc plans but we got an expansion due to the feedback and reception the game earned. God of War also has no dlc plans but is still getting a ton of post launch support. I also wish more studios could make games at this caliber, but if that happened games like these 2 wouldn’t stand out as much, and that’s also not an easy feat to pull off. Ummm Ubisoft apologists??? Maybe fans or supporters would be a better word to not politicize the discussion. I support Ubisoft because they make good games and support their fan base unlike EA and Activision who gouge fans for every penny they can get. Comparing a 3P publisher/developer to a 1P isn’t fair to the 3P. Look at what Ubisoft is doing with Division 2, $60 with 3 expansions planned for the 1st year for free in order to not split their player base and look no further than this article and FC5’s season pass where they included FC3 among other expansions for the main game. Ubisoft had to change and did change in order to fend off Vivendi from aggressively taking them over. It’s also funny that you like their games enough to play them, but choose to not support them by borrowing their games and then calling anyone who does support them apologists. Wonder what your friends think about that comment? Awesome work Ubisoft! I just finished Origin’s main quest line. The game is great (great story, content, graphics, sound, etc). I also think Aya is one of the best female characters to date, no pun intended. I’m certainly buying Odyssey at launch. From the footage, it appears to be the best Assassin’s Creed. Considering the pedigree of Origins, I think this game deserves the same sales success as the first party flagship titles. Will Assassin’s Creed 3 and Liberation Remastered get a physical release down the line? I have no interest in the season pass. While not mentioned in this blog post, it was mentioned in another site’s reporting on the season pass that AC III will be available separately in March when it releases. I figure season pass owners will get early access much like Far Cry 5 season pass owners got Far Cry 3 earlier, same for South Park. South Park got a physical release but FC 3 hasn’t yet so it’s not clear if there will be a physical release for AC III. Hope this helps. @Redcell89 Ummm Ubisoft apologists??? Maybe fans or supporters would be a better word to not politicize the discussion. I support Ubisoft because they make good games and support their fan base unlike EA and Activision who gouge fans for every penny they can get. Comparing a 3P publisher/developer to a 1P isn’t fair to the 3P. Look at what Ubisoft is doing with Division 2, $60 with 3 expansions planned for the 1st year for free in order to not split their player base and look no further than this article and FC5’s season pass where they included FC3 among other expansions for the main game. you sure you aren’t an UbiStuff employee with an alt PSN account, like holy S.
EAi ds Ca$hivision and Ubistuff are all the worst from a customer centric viewpoint. They all have anti consumer practices that a segment of the hobby support regardless of the egregious practices and try to act as this is the norm and if anyone says anything we are taking psychiatric drugs. the fact is Odyssey is the umpteeth edition in a long line of games where both combat and traversal is still flawed or some poorer version of what’s available elsewhere. this is unacceptable. it’s back to being annualized and while pretty looking i personally don’t trust the actual game quality, the 6-7 skus if the game the endless dlc the endless grind to encourage dlc. Ubi is the champion of live services, and while in games like Rainbow 6 there is some argument, there is no argument in single player story based content. earn or business or be on sale within 6 weeks just like EAs trash. they do they because the shell game is just that on sale they can still loot box or up sell after the fact. they used to be better. And damn right i bought persona 5 at launch, dragon quest 11 at launch, uncharted 4 at launch, god of war (every one at launch) heorizon dawn complete at launch, spiderman at launch. i will do so for any game that is top quality / offers real value for money, respects me and my son while we play. this is the thing as consumers our power is when and what we buy. activision EA and Ubisoft all get what they deserve and it’s ehy they play the strategy they play. Activision used to never discount now they do. why do you think that is? EA and Ubi discount the most why do you think that is? there is a logical situation here, games like spiderman, god war, hzd earn instant trust for the future. the big 3 don’t they sell to new batches of customers and casuals. Nintendo sells their first ip to kids and families full price, but they release full content quality games, therefore no sales. ac odyssey may be good but not the vanilla sku and it remains to be seen, i used to respct and like AC but you realize it’s mainly the setting that you buy, the rest is inferior. this is the nature of competition, why is all the dlc and season pass and micros there? to keep you playing and not trading in, but how does this stack up to being competitive in the market and finding the customers time. where are games like ac fitting in? and do they even deserve to. this is a big reason people skip games and play much later. i am also able to borrow big games 3 weeks at a time from the library. exclusives will always offer more value, it’s the nature of the platform holder needing to incent customers, but games that don’t respect our time, have all this grindy ways to browbeat customers to spend after thr fact and even target our children cannot be allowed to hide behind player choice and all the rest.